Whether it’s accessing business apps, collaborating on projects or just checking email, the web browser is increasingly becoming the place where employees get their jobs done. In fact, 76 percent of companies employ browser-based email, and 70 percent have adopted browser-based office applications, according to a recent Forrester study. Since employees spend a lot of time in their browsers at work, we wanted to share some ways you can customize Chrome Browser to help employees stay focused. 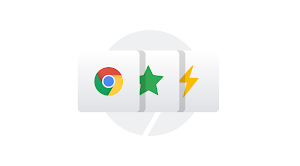 Chrome Browser has many built-in capabilities that IT admins can use to pre-install bookmarks, apps, and extensions, centrally manage policies, and provide an optimal web browsing experience. Here are five things IT admins can do with Chrome Browser to help teams work more efficiently. 1. Use Chrome Sync to get fast and easy access across devices. With Chrome Sync, an employee’s browser history, bookmarks, apps, extensions and even open tabs can follow them from device to device throughout the day—even as they switch across Windows, Mac and Chrome OS platforms. 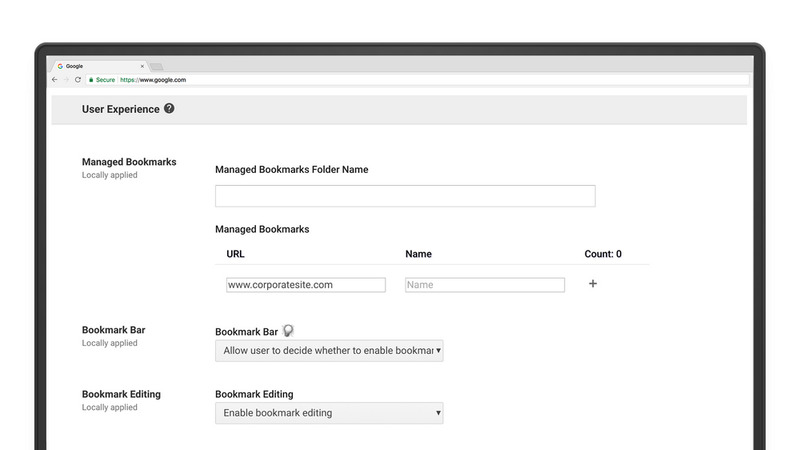 IT can also manage bookmarks centrally through policy, pushing out links to important sites and web apps that users can access from any device when logged into the browser. 2. Help users stay secure through Safe Browsing. 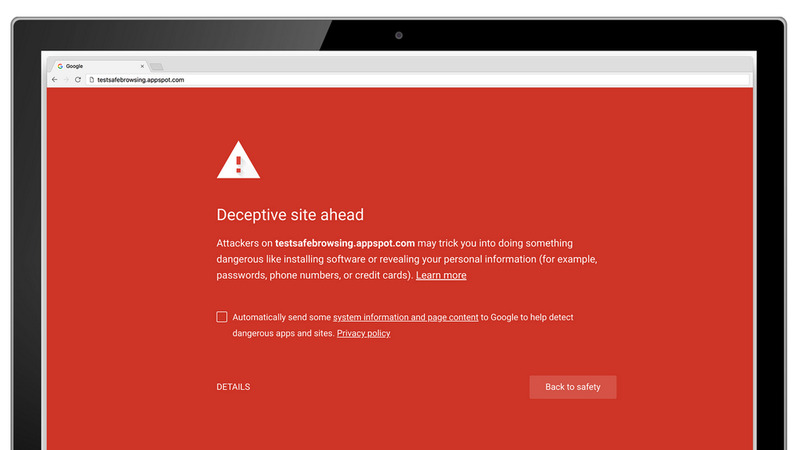 With Safe Browsing, Chrome Browser automatically notifies users when a site may be malicious, so they can avoid it. This means employees can avoid threats that might result in spending hours recovering from an infected device instead of getting things done. IT can allow users to decide if they want Safe Browsing turned on, or they can set a policy centrally to enable or disable it. 3. Block intrusive ads so employees can stay focused. Intrusive ads can be a drain on anyone’s peace of mind. 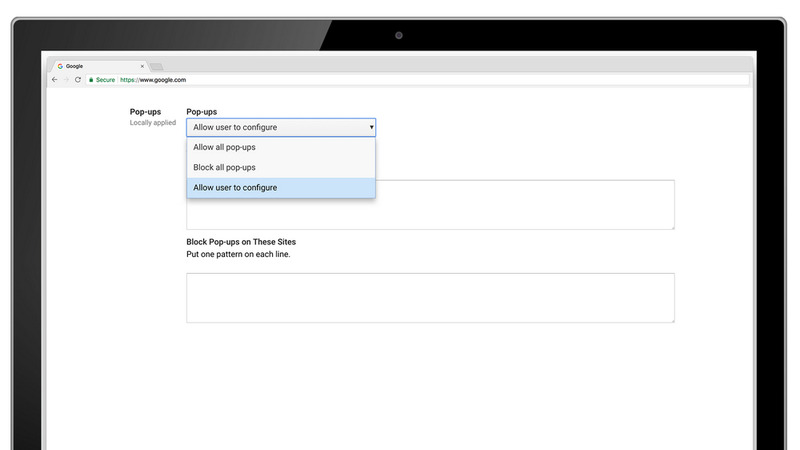 By enabling Chrome Browser’s automatic pop-up blocker through set policies, IT teams can help employees stay on task without being distracted. Chrome Browser now automatically filters links to third-party websites disguised as play buttons or other site controls, or transparent overlays on websites that capture clicks and open new tabs or windows. 4. Use a standardized homepage for employees. IT admins can set employees’ homepages to internal sites so they have the latest tools and most up-to-date information. 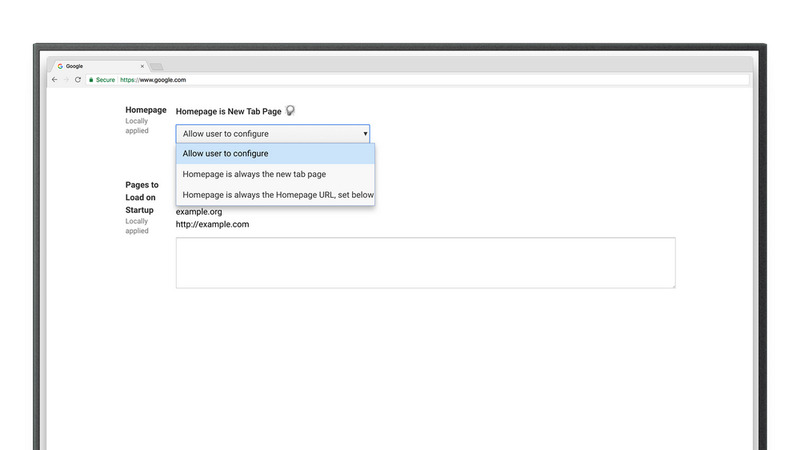 And with Group Policy or Cloud Policy, IT can easily set different homepages for different groups in the organization. 5. Pre-install apps and extensions for easy access and security. IT admins can make it easy for employees to access the apps and extensions they need to be productive while maintaining the right security policies. They can deploy selected apps and extensions tailored to an employee’s department or role, whether they're internally built or public, like productivity or CRM apps, giving them easy access to the tools needed to do their work as soon as they open their browser. Visit Device management > Chrome > User Settings in the Admin Console or check out these instructions. These are just a few ways IT admins can manage Chrome Browser to support user productivity. To get started with managing Chrome Browser for businesses, visit our website. 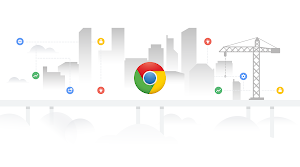 And for information on how to set up, manage and configure Chrome Browser for your enterprise, check out our help center.